Steam is the most widely used medium to accomplish sterilization in many of today’s life science industries such as healthcare/hospitals, pharmaceutical and, research. The use of steam under pressure has been employed for almost 150 years and continues in popularity to this day owing to its relatively low cost of operation, ease of use, safety and overall availability. However, steam alone is not sufficient to guarantee conditions are met to attain sterility. Air removal is also a critical factor in assuring the essential temperatures are uniform within the chamber. There is, however, an exception to the air removal rule. The “Air Over Pressure” cycle is designed specifically to incorporate air with the steam to raise the operating pressure to keep sealed containers in the load from bursting. In that case, much care is given to mixing the air with the steam to provide uniform temperature at the higher pressure, but this special case is outside the scope of this article. While many options exist today for conquering air removal, a common misconception exists within the industry that the mechanical vacuum pump is an “enhanced” option over the alternative, ejector technology. The purpose of this article is to provide a high-level overview towards the importance of air removal and considerations that should be made when selecting which technology, vacuum pump or ejector, is optimal for your application. Steam sterilization is the application of three essential parameters: temperature, pressure and time. 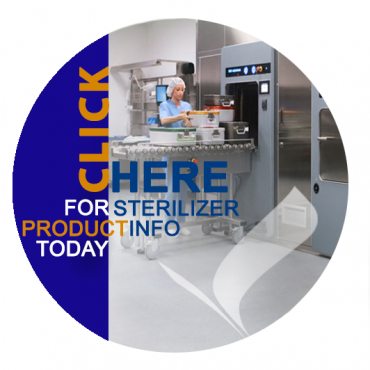 Sterilizers consist primarily of a closed chamber (or vessel) and a source of steam. One of the main challenges in achieving steam sterilization is attaining a constant temperature across the entire volume of the vessel, as well as the objects to be sterilized themselves, for a fixed time to assure the desired Sterility Assurance Level (SAL) is realized. Sterilization vessels can range in magnitude from incredibly small (e.g. less than one cubic foot) to especially large (in the range greater than a thousand cubic feet). Irrespective of dimensions, it’s crucial that air be removed from the vessel to permit steam to circulate without barriers and allow direct contact with the items being sterilized. Entrapped air can act as an insulator from the steam and thwart direct steam contact, which is required for steam to transfer energy, in other words, heat. It is noteworthy that a single vacuum pulse, even in the range of 29″ Hg. depth is only effective in eliminating approximately 97% of the air within the vessel chamber. When this is combined with the potential for non-condensable gases, i.e. air, in the steam supply, it can be challenging to achieve a homogeneous temperature within the chamber and load. As a result, multiple vacuum pulses, combined with steam ‘backfills’, are typically required. Air removal isn’t the only purpose of a vacuum device during a sterilization cycle. It’s also commonplace in many cycle methods to perform a post-sterilization vacuum, or vacuum/air pulses, to promote condensate removal. Condensate can also act as an insulator and prevent any surfaces from achieving the necessary temperature required for sterilization, but condensate removal as a topic demands a paper of its own and will not specifically be addressed here. By exercising the vacuum process at the end of a cycle, the boiling point of water i.e. condensate, is lower and can flash off any residual moisture. Condensate can also present challenges to sterilization, but that is a subject matter outside the scope of this article. 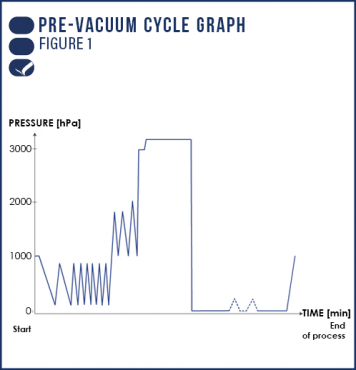 Now that we’ve discussed the significance of air removal, and thus vacuum conditions in the steam sterilization process, let’s look at the two main mechanisms commonly utilized today for reaching optimal operating conditions – vacuum pumps and ejector technology. A vacuum pump is a rotary or reciprocating vacuum-generating device that is highly mechanical and more subject to maintenance and higher failure rates. It is typically powered by an electronic motor. A vacuum ejector (also known as a vacuum venturi device) is powered by compressed air, steam or water, and because of its simple design, requires less upkeep yet comfortably sustains its effectiveness. For purposes of a comparative discussion, we are going to highlight the water sealed liquid ring vacuum pump and the water ejector since they are arguably the most commonly used among steam sterilizers. A liquid ring vacuum pump compresses gas (air from the chamber) by rotating an impeller with a cylindrical casing by means of an electrically driven motor to rotate the impeller shaft. Liquid (generally water) is supplied into the pump and, by centrifugal acceleration, creates a moving cylindrical ring against the inside of the casing. Air from the chamber is pulled into the pump housing through an inlet port at the end of the casing. The gas is then trapped in the casing formed by the impeller and the liquid ring. The reduction in volume caused by the impeller rotation thus compresses the gas, which is then discharged at the other end of the casing through an outlet port. 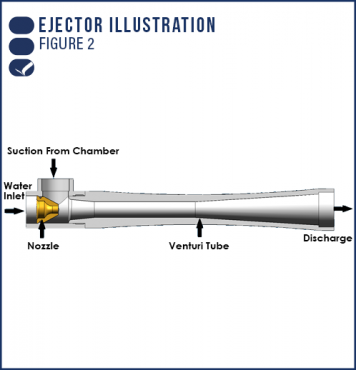 Water ejectors are like vacuum pumps but use high pressure water to draw out gases (air) from the sterilizer chamber. The ejector takes advantage of the venturi effect, which determines that the velocity of a fluid increases as it flows through the narrower tube while the pressure decreases, due to a conservation of energy. The effect is an example of Bernoulli’s principle. The ejector utilizes the kinetic energy of the water to ensnare gases, vapors or other liquids and then discharge the resultant mixture to a drain as shown in Figure 2. Since both vacuum pump and ejector methods use water to trap or draw air from the vessel into the drain line where it is expelled from the system, and steam is simply water in a gaseous state, there are no issues with mixing. At the end of the cycle when steam is being evacuated from the chamber, the seal water, or motive water for ejectors, can assist in quenching the steam and lowering the condensate temperature before dumping it into a drain. Furthermore, no potential carry-over of seal liquid to the drain needs to be of concern, as may be the case with oil sealed liquid ring systems. Typically, any water released to drain must first be below 140°F (60°C) before being transferred. You should also verify your specific requirements with your local authorities as different requirements may exist based on your site’s location. Over the years the drawbacks and advantages of vacuum pumps versus ejectors as system options have narrowed significantly. As for vacuum performance – the depth of vacuum capability over time – it would be difficult to argue in favor of either technology since a direct comparison is not always possible given the countless variables that can change from one implementation to the next (e.g. sizing, power input, water flow or temperature). In the past, it was argued that ejectors utilize more water, but both approaches tend to be employed with recirculated water systems. This also includes cooling of the affected water, since the temperature of the water may affect either technique’s performance and water utilization. Many operators would find using a steam sterilizer with a water ejector to be a more optimal solution when compared to vacuum pumps. It’s important to mention that water ejectors become less effective at chamber volumes exceeding 3,000 liters (105 cubic feet), so a vacuum pump would be a better choice above this threshold. When considering your next sterilizer purchase or retrofit project, it’s highly recommended to pay close attention to this aspect of the design in your selection process. Most sterilizer manufacturers will offer you both options, but it’s imperative to consider the details of the engineering data and implementation of your preferred approach. The design criteria of your application relative to either system functionality is what will permit you to take full advantage of the benefits with few, if any, compromises in your sterilization operations. Want to learn more? STEQ America is the official distributor of Matachana steam sterilizers for the pharmaceutical industry. We are proud to be offering these premium European sterilizers to the U.S. market, along with the unrivaled service and support that Matachana has been delivering to its valued customers for more than 50 years. A member of our team is standing by to provide you with a personalized consultation. Contact David Mitchell today. Email dmitchell@steqamerica.com or, call (267) 644-5477.